Jaypee Vidya Mandir is located at Vishnupuram 5 Kms North of Joshimath, along NH-58 towards the Holy Shrine of Badrinath. 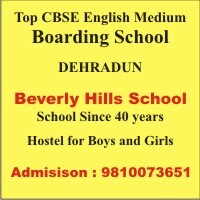 The school has picturesque surroundings, pollution free environment and forested rugged mountains with the musical Alaknanda River flowing below it in the renowned Dev Bhoomi of Uttarakhand. The Jaypee Vidya Mandir has been built on the sound edifice of traditional wisdom and futuristic thought. We believe that in the highly competitive world of the 21st century, it is as essential to develop cutting edge knowledge as it is to imbue traditional values. It is these guiding principles that have been instrumental in developing the education and training model of the school.